Are you looking for a place where you can store some of your belongings after your upcoming move? Or maybe you will live abroad and need storage for furniture or other household items you won’t be taking with you? Either way, Strong Move provides safe and secure storage services in London. Your items will be stored inside damp-proof containers and will be professionally monitored by CCTV cameras. You can choose between short-term and long-term storage periods for your tailored removals and storage service. Even if you need your items stored for only a couple of days, Strong Move is the reliable option. The minimum storage period with us is 7 days and we work around-the-clock to guarantee constant customer service - you can give us a call when it’s convenient for you, and always count on getting a quickly arranged secure storage solution. You will also receive a full refund on any unused storage space. Our storage services can cater for all situations you may have, from moving home to moving offices. 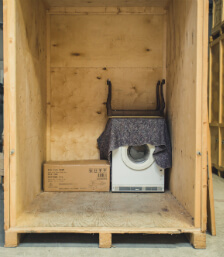 Our storage service are most suitable for: decluttering your property, home renovations, making free space, student storage for international students who vacate a property, temporary storage of office items, archiving and more. It can be used when you are relocating your office, moving overseas for a period of time, or if you are moving house and have a time gap between the two properties. A video survey might be necessary in order to provide you with a precise end quote for the job. Video surveys are done at your convenient time and all you need is a smartphone or a tablet with a camera. Our surveyor will be guiding you through the process. The movers will arrive promptly and find the parking space that you've arranged for us. We'll assist with the careful loading and transportation of your possessions - it's part of the service! We give insurance for your items during the transportation to the storage facility. You'll be able to take advantage of our great packing service or packing materials delivery if you need any. Your items will be safely conveyed to a storage facility, where they'll be kept safely until you need them! The storage container will be sealed and monitored with CCTV 24/7. You can always rent additional space while using our storage service, in case you have additional items. We understand perfectly that everyone has different reasons for using storage and that everyone has different duration needs. You can use the storage containers for six months, nine months, a year, or more. Whether you are downsizing your home or remodelling it, and need a safe place to keep all of your belongings. Or you are moving abroad for a year and are vacating your rental property? Or are a business relocating from one end of London to another, and have a gap between the moving in and out dates? We can help. You can rely on us for keeping your items safe. You can book one or more storage containers to fit all of the things you need to leave aside for a while. Items you can store long-term: mattresses, bikes, sofas, wardrobes, tv units, large appliances (fridges, washing machines, ovens, etc). And all types of office items. You can also hire a team of movers to pick up the items and transport them to the storage facility and to bring them back to your home when the storage period is over. Looking for short-term service near you? Don't worry, you can move your belongings to a storage container and keep them safe until your new property is free for you to move in! Or until your renovation is ready. Bought a new piece of furniture and need a place to keep your old one until you decide what to do with it? You can use this service for as little as one week! The storage period is defined by you. Whether you need to keep your household items off-site for two weeks or two months, you are free to do so! You can hire man and van service to easily transport your items to the storage facility. *The price is per week, per wooden container with the capacity of 250 cubic ft (approx. 35 sqft or the size of an average garden shed). *Price is subject to availability. T&C and minimum charges apply. *One week is the minimum period of storage service. *The price is for areas within M25. *We can provide additional smaller packing boxes per your request. *£7.50 per container is a one-time payment for security blankets to protect your items. *£15 deposit per container is taken at booking and refunded when you leave. With over ten years of experience of helping people safeguard their possessions between properties, the hard working and highly motivated team here at Strong Move have collected some great feedback! Selecting us as your removal and storage company means that you're getting removals and storage service that's been designed for someone just like you. We provide a convenient way to schedule the assistance that you need with moving and storage. ... and then if you are pleased of our offer you should get ready to start your service! Discounts – If you pay up front, you will benefit from a discount for a 6-month period of storage usage. For more details, see our prices page or talk to our sales specialists. The offer is subject to availability. An insurance for the storage is made upon further request from the client. Each customer signs a contract and an acceptance form with us. It is about storing your belongings on your behalf - papers which all storage companies in London request. Upon re-delivery, after you furniture is brought back to your home, we are able to offer you a furniture assembly service upon your request. If you need a large storage container for overly sized items, we may need to make a survey of your items before the movers come to load them into the vans. We can assist you with storage for your items during the summer when you’re back home! We help businesses keep their unused furnishings and equipment safe, monitored by CCTV cameras. While renovating your home and need safe space to keep your furniture, we will give you that! We can leave the property immaculate and satisfy the landlord and the tenant. Whether you need a temporary or a long-term storage solution, we can help you. Strong Move can arrange a safe place to store your belongings. Give us a call on 020 3746 2535, enter your details into our easy-to-use contact form, or speak to us online using our website's chat to arrange professional moving and storage from our team. We ensure a safe house removals service and we also offer office removals throughout the UK and outside of it.